The assembling and editing of the letters of the late Howard Phillips Lovecraft has taken August Derleth and Donald Wandrei more than a quarter of a century. 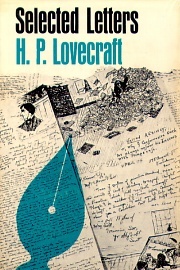 Lovecraft wrote so voluminously to his correspondents that comprehensiveness in the published letters was neither desirable nor possible, and the editors found it necessary to edit and re-edit time and again. Lovecraft was certainly one of the great epistolarians, one of the most erudite correspondents, writing in a pattern that added up to attenuated conversations. He emerges in his letters as a man who has come to terms with life within his limitations, one devoted to Eighteenth Century England as much as to his native Providence, Rhode Island, where he spent a relatively solitary childhood, beset by uncertain health, and driven by solitude to create worlds of his own, beginning with Greek and Roman mythology and ending with the macabre Cthulhu Mythos. A major writer in a minor division of American literature, Lovecraft had a poor opinion of his work and little market for it; he was forced to support himself by revision work—a labor of the most menial kind in literary annals. Among his diversions were imaginative books, architecture, and an abiding interest in antiquarian New England, an interest later extended to old cities of the continent, from St. Augustine to Quebec. This first volume of Lovecraft letters begins in 1911, when Lovecraft was 21, and ends in 1924, at the time of the dissolution of his brief marriage. Selected Letters I (1911-1924). By H.P. Lovecraft, Edited by August Derleth and Donald Wandrei. Sauk City, WI: Arkham House Publishers, Inc.; 1965; ISBN 0-87054-034-3; Hardcover.